The ApiShield trap completely replaces the traditional solid hive floor. When first installed under a hive, the side entrances should be blocked for at least 3 days with the supplied bars. 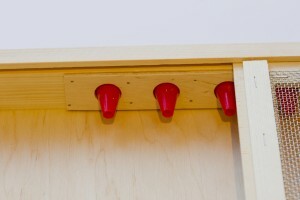 This teaches the colony’s bees to enter only through the hive entrance, which they can protect. Although the floor can be in place all season, we strongly recommend that the side doors are not opened until towards the end of the season, when it will trap the pests of honey bees. After three days bees from the colony have learned that their entrance is at the front only. When the bars are removed, the bees will not use the side entrances but predators will enter through these unprotected openings, attracted by the natural scent and sound of the colony. No bait is required. Cone entrances prevent the invaders from leaving the ApiShield trap and they will die from dehydration. ApiShield is the world’s first integrated trap to safeguard honeybee colonies from predation by hornets, wasps, wax moth and robber bees. ApiShield has been developed by Vita, based on the ApiBurg® trapping system by renowned bee scientist Professor Ifantidis working in conjunction with scientists and bee research organisations around the world. 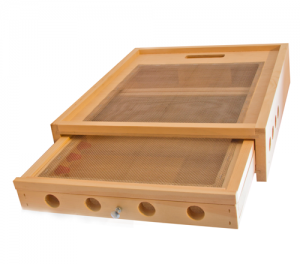 Manufactured in hard-wearing pine wood (a polystyrene version will be available soon), ApiShield is currently available in the following sizes: Dadant (43 x 50 cm), Langstroth (43 x 51 cm) and British National (46.5 x 46.5 cm). Economical: ApiShield’s high durability with no on-going costs makes it a highly economical investment. No extra apiary visits: unlike bait traps, which can require frequent replenishment, ApiShield maintenance can be easily incorporated into your usual husbandry routine. No chemicals or bait changes: the honeybee colony odour is the only bait required and is constantly present in any hive and always attractive to hornets. Specific: ApiShield traps only pests affecting honeybee colonies – hornets, wasps, wax moth and robbing bees. Unlike bait traps, ApiShield does not affect non-target organisms and pollinators. Sustainable: late-season trapping of hornet queens reduces the number of new hornet nests next year, keeps hornet populations down and inhibits invasive spread. Disease protection: ApiShield guards against robber bees, which are known to transmit a wide spectrum of infectious diseases and honeybee pests, such as Varroa mites. Scientific studies around Europe have shown that ApiShield offers equivalent or greater efficacy in trapping hornets compared to traditional bait traps while incurring much less management. ApiShield offers even greater efficacy in trapping wasps. During the most dangerous phase (late in the season), hornets are significantly more attracted to ApiShield than to bait traps. Next year’s hornet queens are also most likely to be trapped, offering pre-emptive protection for the following season. Unlike bait traps, ApiShield does not trap non-target pollinators such as flies, beetles and butterflies. Colonies protected by the ApiShield trap show significantly higher survival rates than unprotected colonies. Treat ApiShield with a suitable bee-friendly timber preservative. You can remove ApiShield in autumn after the first frost. Replace again towards the end of the next season. If a colony is relocated, ApiShield side entrances should be blocked for 3 days to ensure worker bees once again orientate themselves to use the proper hive entrance. 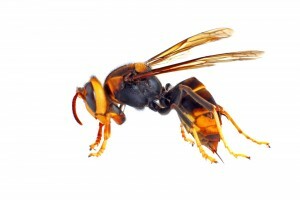 In previously uninfested areas, please report any suspected Asian Hornets (Vespa velutina) to the relevant authorities immediately, preferably by sending a sample for analysis. ApiShield traps can be checked frequently to act as a sentinel and alert beekeepers to invasive predators. ApiShield trap drawers can be immersed in water for a few minutes to safely kill predators before their disposal. ApiShield is most effective against Asian Hornets late in the season (around September in Europe). Vita’s ApiShield trap, also known as the ApiBurg® trap system, is a registered patent of Professor Ifantidis, Aristotle University, Thessaloniki, Greece. ApiShield is currently available in the UK (through BBwear, Beckys Beezzzs, Bee Bitz, City Bees and Ropers Honey), in France (please contact ApiNov), in Portugal/Spain (HiFarmaX) and in the USA (Dadant). Please contact your local dealer for further information. Although the Asian hornet has spread through much of western Europe, it appears not to have established itself in Britain and, to date, the sea is providing something of a barrier. There have been sightings but so far all nests appear to have been destroyed.